We’ve saved our customers thousands – what could we save you? Call us now – a 15 minute phone call could change the way your accounts payable department works! Or why not join one of our free 20 minute webinars and we’ll show you exactly what we do and tell you about how our customers are using our accounts payable solution. If it’s not for you, no problem, we’ll leave it there. We’re not interested in the hard sell, just working with like-minded people who want to save time and money. Our accounts payable solution is a streamlined system that will save your business time and money, and greatly improve accuracy and efficiency. The accounts payable solution integrates with existing in-house Finance/ERP systems. Data is captured from paper and electronic (pdf) invoices, recognised, interpreted and processed with little or no intervention. A process that can take multiple time-consuming steps from receipt of an invoice to approval and payment, can now be completed in a matter of seconds. Faster processing of invoices allows businesses to take advantage of early payment discounts for significant cost savings. 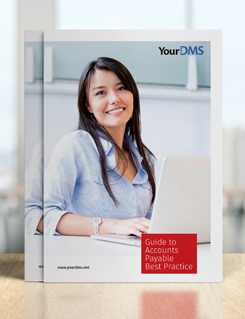 Get your free guide to the best practice for accounts payable. YourDMS provides solutions to meet all budgets – contact one of our specialists to discuss your requirements or request a demo today. The changes that YourDMS have implemented for us have made a huge difference to the way we work! With our systems now integrated, it only takes a few seconds to find the document we need. And the improvements to our invoice approval processes, and the use of intelligent workflows, has allowed us to pay invoices much more promptly. All of which has improved productivity and saved money across the business.